Dr Christopher Suckling (Guildhall School) discusses his work in editing, performing and adapting Purcell's King Arthur. 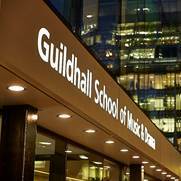 Dr Christopher Suckling (Guildhall School) reflects on the process of editing, performing, and recording Purcell King Arthur with the Gabrieli Consort & Players. He suggests how his performance influenced his scholarly practices and examines how the tensions between musical instinct and historical deduction led to a distinctive interpretation.